When the Oakley Drive-In turned out the lights around 15 years ago, Cincinnati lost its last open-air movie theater. 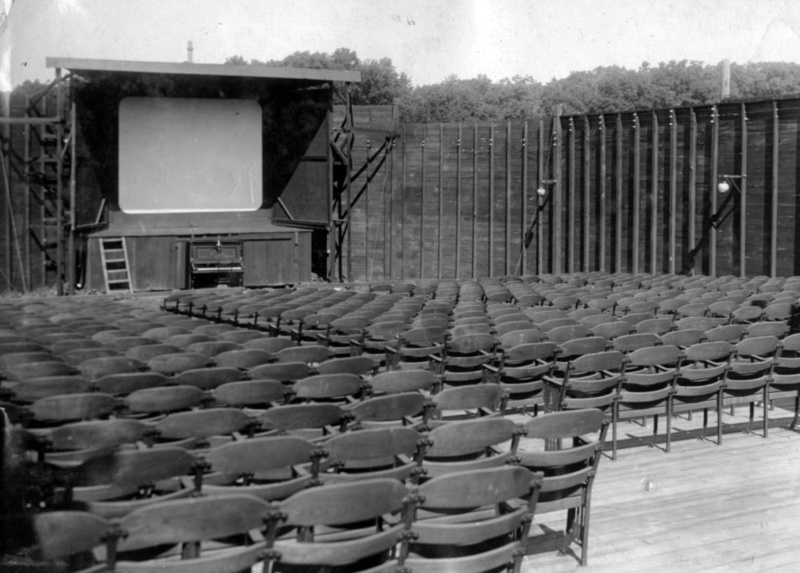 Few people recall that Cincinnati’s first outdoor movie theaters opened long before automobiles were popular. They were called airdomes. It is difficult these days to track down information (or images!) of these sky-covered motion-picture halls, yet Cincinnati boasted quite a few of them. Airdomes sprang up like mushrooms in urban vacant lots from around 1905 to 1925. Most, as in this illustration, had a refreshment area outside the screening enclosure. The heyday of airdomes was 1910 to about 1930 and they could be found from coast to coast. Airdomes were particularly popular and long-lived in the tropically southern Plains states from Kansas to Texas, but they were equally prevalent in regions where even summer nights could get downright chilly, like Long Island and the shores of Lake Michigan. The interior of the Saugatuck, Michigan airdome indicates the standard layout of the open-air theaters. There is a piano located beneath the screen to provide the “soundtrack’ for the silent movies shown there. A partial list of Cincinnati airdomes finds them distributed from the West End to Avondale, from Covington to Oakley and from Westwood to Linwood. Even Coney Island and the Cincinnati Reds opened airdome theaters. The 3,000-seat venue at Redland Field was one of the very few airdomes with a roof. Most of the others depended on fair weather and at least one Cincinnati airdome was forced into bankruptcy because of a rainy summer. Although airdomes flourished unmolested in Cincinnati, some neighboring municipalities took a dim view of these new-fangled operations. Norwood Mayor William M. Fridman decided to crack down on an airdome showing films on Sundays. While Norwood’s indoor movie theaters paid $20 per month for a license, Mayor Fridman announced that the airdome had to pay $5 each and every day. Owners of the Norwood airdome sued and Mayor Fridman was forced to treat it like any other movie theater. Although most airdomes exhibited only moving pictures, some, notably the Coney Island airdome, presented live vaudeville shows as well. Airdomes made good locations for politicking and the Linwood airdome was not the only one used for a public debate. It appears that airdomes lost their cachet as indoor movie theaters adopted air-conditioning as a selling point, and Cincinnati’s last airdome sputtered into obscurity around 1929.